This semester was a change of pace from previous semesters and costuming work that I’ve done. Instead of costuming the production of a play, I am costuming a dance production with ten individual dance pieces. With there being ten unique and individual pieces within this show, (and with one of these pieces being a repeated performance with previously designed costumes) my main objective was to create a unified complete performance through the costumes. Through discussions with the nine choreographers, I decided the unifying element would be the color palette and the concept of layers, with each of the costumes being layered in some aspect; either through color blocking, paint, or physical costume layers being included. Through this connection, all pieces keep their individuality, but are unified as a whole production. 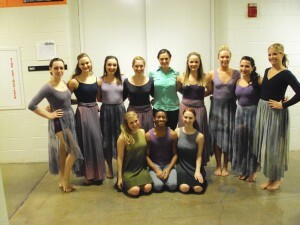 The below pictures are examples of the final costumes for the Emerging Choreographer’s Showcase. All pictures are taken by myself (Rachel Maggs).